My daughter Katie helped me care for this Sora. Both its legs were broken in a collision with a Walmart parking lot where a marsh had been drained. Now, after 4 weeks, it was fully healed, and we were about to drive it to a large marsh for release. Perhaps the finest of all human emotions is mercy. There are many documented cases in nature of birds and other animals helping family and flock members in trouble—I reported on one case with ravens just last week. And there are also documented cases of wild animals helping other species—such as dolphins rescuing humans and even dogs! So we humans may not legitimately stake a claim on uniqueness in the animal kingdom for compassion and mercy, but these qualities are among the finest characteristics of our species. The impulse to help people or animals in trouble is a noble one. Unfortunately, even those with wonderful intentions can make a lot of situations worse unless we have accurate knowledge behind that intended mercy. 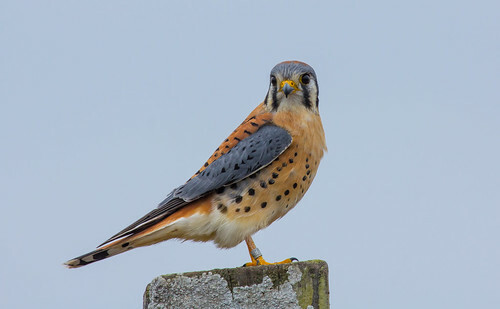 One of the stories that went viral this week was about the Florida man who came upon an American Kestrel that appeared tame. News accounts don’t explain how he found it, but my guess is that the little falcon probably had a head injury from a collision. The man wanted to keep it as a pet, and when told he had to give it up because it was a protected species, he gave it a goodbye kiss, and the kestrel bit off a large chunk of his lip. American Kestrels are fierce little predators. They are intelligent and devoted to their families, but utterly incapable of wrapping their heads around the concept of kissing. That story highlights two unfortunate but basic human impulses—to possess and subdue wild creatures, and to interpret animal emotions based on facial features. Falcons have large, dark eyes, rather similar to the eyes of our most successfully domesticated species, the dog. Dog faces may be endearing, but it isn’t the darkness of their eye color that indicates their disposition. And the expectation that any falcon would want to kiss anyone—even its own mate—is rooted in ignorance. Falcon mates show their devotion not by preening each other’s faces but by forking over bird carcasses. To any reasonable falcon, someone sticking their face into yours would be a dangerous act of aggression, so naturally the kestrel fought back. Ironically, the very same Shakespearean play that gave us the phrase "the quality of mercy" also gave us "a pound of flesh." Reading any animal’s emotions is tricky for our species. Whole books have been written about recognizing the body language of our pet dogs, and the whole reason we so successfully domesticated them in the first place was because they’re so relatively easy to read. 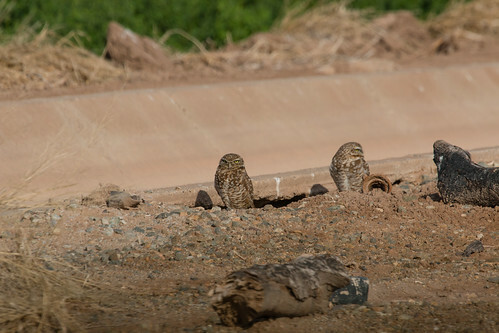 These two Burrowing Owls near the Salton Sea were used to people driving along the roadside. 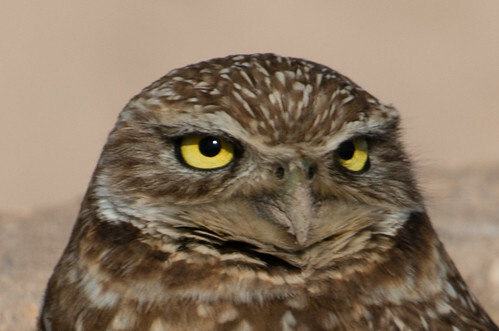 I posted photos of two Burrowing Owls on Facebook this week, and lots of people commented about how angry they looked. The mated birds were standing together at a burrow while we stayed in our van on a nearby road. These birds had to have been acclimated to traffic and people to select that nesting site in the first place. Of course, our presence may have annoyed or even angered them, but what we think of as facial expressions didn’t provide evidence of that. Their "expression" was simply due to the fact that their skull protrudes a bit above the eyes to provide shade, superficially resembling the way a cartoonist draws a person’s eyebrows together to portray anger. Notice how the protruding but feathered skull shades this bird's eyes from the bright California sun. How it is feeling is anyone's guess. It wasn't talking. For being the species that includes rocket scientists and brain surgeons, it’s strangely hard for many otherwise intelligent people to think through the reality that each species has an intelligence and emotional range that encompasses its own unique spectrum, based on unique requirements dictated by its body structure and natural history. Protecting people from their own well-meant but uninformed impulses is one half of the reason we’re prohibited from handling protected species without a license—our misunderstandings about animals, even when well-meant, can lead to serious injuries for people. It may be both merciful and wise to rescue a Great Blue Heron that was hit by a car or entangled in fishing tackle, but unless the person retrieving or caring for it is properly trained and wearing proper protection, the heron is likely to jab, aiming straight for the eyes. The largest Great Blue Herons weigh less than 8 pounds, but do have powerful neck muscles and a powerful beak, and of course they're going to protect themselves with every fiber of their being. 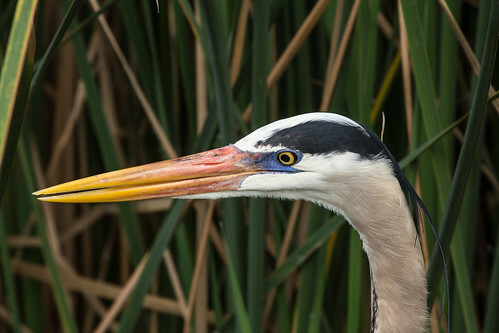 Great Blue Heron bills can pack a wallop, easily poking out an eye. Rescuing a loon stranded when ice closes in will save the bird only if the person can retrieve it safely—without the right equipment and know-how in dealing with thin ice, it’s likely that both the person and the loon will end up dead. Even when I was licensed, I never had the means, skills, or boating equipment to retrieve any birds over water. When a sick bird or other wild animal is found, it’s important to be able to quickly and accurately diagnose the problem, both to ensure that people handling it, along with their children and pets, don’t also get sick, and to give the animal a significantly better chance than it would have if left alone. Even with all my years of experience as a licensed rehabber, I got sick in Costa Rica after briefly handling a beautiful and healthy Blue-gray Tanager that had collided with a bus. This is my hand holding this Blue-gray Tanager that struck a window on a nearby parked bus. The bird flew off moments after the photo was taken. A glistening plop of poop ended up on my finger, and by day's end I was very sick. 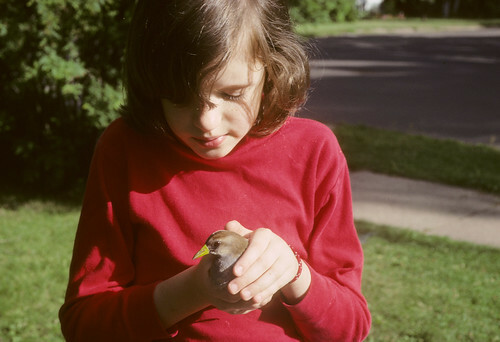 With all my experience, I completely forgot to wash my hands with disinfectant after handling the bird. It was nothing serious and I was fine by the next day. But still...washing your hands after handling a bird—while you're eating!—is hardly rocket science. Of course, protecting humans is only one half of the equation that led to the laws prohibiting non-licensed people from handling wild birds. The other reason is that without knowledge and training, we can harm the very birds we're trying to help. When I was rehabbing, I’d feel a visceral pain when anyone called up about the baby birds he or she had “rescued” a week or so before. More often than not, the person was now wondering why the little things seemed to be losing interest in food—at that point, the nestlings had already begun the dying process and there was usually virtually nothing I could do to save them. The kinds of food offered and the frequency of feeding both require knowledge and more time and attention than most people can give, and parent birds give their young a lot more care than just feedings. Most songbirds remain with their parents for weeks—some for months—after fledging, as their parents teach them the ropes of survival. Without that, how can we expect the baby birds we “save” to survive? When a bird hits a window in winter, many people bring it into the house thinking that will of course be better than being in the cold. But our winter birds are so physically acclimated to cold that a comfortable room temperature for us can seem unbearably hot to them. Of course, leaving them on their backs out in the cold will also doom them. The simplest and best thing to do in this situation is to right the bird and put it in a protected but fairly cool place for a few minutes, in a closed shoe box or other darkened enclosure, and take it outdoors to open the box every 10 minutes or so until the bird flies off. If a wing or leg appears injured, or blood is coming from anywhere, the bird should immediately be brought to a licensed rehabber. Over the years, many people have told me that they cup the bird in their hand and breathe on it, and it miraculously flies away. This is an old wives' and husbands' tale, as cruelly ridiculous as breathing on a brain-injured person to heal him or her would be. I’ve picked up at least a few hundred birds with head injuries from collisions during my lifetime, and never once breathed on any of them—nonetheless, most of them flew away just as quickly, without being exposed to a wash of hot carbon dioxide and germs from my mouth. Tragically, about 50 percent of birds that do fly off after hitting a window still end up dying from hematomas and other injuries that we don’t see, but 50 percent survive. When this Red-eyed Vireo struck my window, it was badly dazed. I placed it on a bit of wood (easy for its feet to grip) inside a cardboard box. Every 10 or 15 minutes, I took the box into my yard and held the piece of wood, to see if the bird was ready to fly off. After 45 minutes or so, it did. Witnessing a natural predation event can be extremely heart wrenching, so I do understand the impulse to intervene even as I know how absolutely wrong-headed it is. One time I witnessed a Cooper’s Hawk tearing into my own personal backyard robin—the beloved male who sang from atop my spruce tree for at least three years running. He was screaming, his mate was squawking and dive-bombing the hawk, and the hawk was ripping chunks out of his pectoral muscles while he was still alive. Meanwhile three crows had descended to observe the scene, and maybe capitalize if the female robin succeeded in chasing off the hawk so the crows could finish up whatever of the male robin remained. My natural human impulse was to step in, but what possible good would that do any of the six birds on the scene? There was no way, with his breast sliced open and chunks already missing from his flight muscles, that the robin could ever fully recover. Some people told me I should have at least denied the hawk that meal, but sending it off hungry would have simply meant it would have to kill another bird that day. And compassion for wildlife has to extend not only to the victims but the hungry predators. In the four decades I’ve been birding, I’ve watched far more unsuccessful hunts than successful ones—statistically and in terms of individual birds, it’s harder to live a long life as a predator than as prey. Wild creatures are what they are. Why feral cats are not "natural predators." Of course, this line of reasoning brings supporters of feral cat colonies to claim I’m hypocritical, because I do believe in intervening when domestic cats are killing birds, and I do advocate getting all outdoor cats, feral or owned, out of the wild. One of my own cats was part of a TNR program before I took her in, and both of my cats were feeding on birds before I brought them home to lead the rest of their lives as indoor cats. I love them, and wish all cats were so loved. But exactly as our society had to do with dogs running loose, we have to get rid of cats running loose in the wild, and for exactly the same reasons. Cats are now the number one domestic carrier of rabies, cats transmit toxoplasmosis to people, and cats are the number one killer of wild birds. Cat owners and supporters of feral colonies should be fined exactly the same for poaching the wildlife their cats kill as anyone else who causes the deaths of protected wildlife. 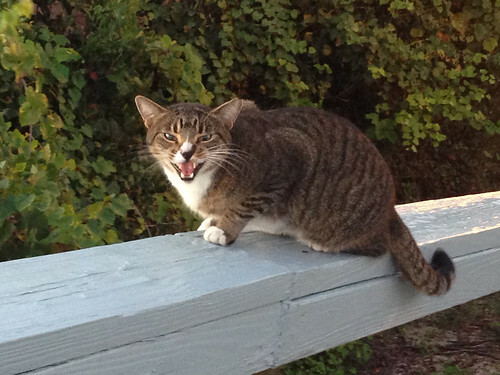 This feral cat in coastal Georgia posed a danger to humans as well as birds. Aren't cats natural predators? They are indeed predators by nature, but they aren't natural in the sense of being part of the natural ecosystems in America. Rather, they are subsidized killers. As long as people provide them with supplemental food, their populations never drop when prey numbers decline as do populations of foxes, raptors, and other natural predators. Shouldn't we show feral cats the same mercy that we show other animals? Yes, in the same way that we owe rabid dogs and packs of feral dogs mercy. They should be removed from the wild and dispatched humanely if homes cannot be found for them. Taking pity on and helping animals deserve more nuanced approaches than simple sound-bytes can explain. The quality of mercy is indeed strained when we act with kindness that isn't informed by knowledge. Again, we are the species that contains within our numbers every rocket scientist and brain surgeon on the planet. Our brains and our hearts should be both engaged and large enough to guide us through these murky waters. Peregrine Falcons, like all natural predators, die or move on when their food supply dwindles. Unlike them, feral cats are subsidized killers. The Ivory Gull is dead. Long live the Ivory Gull!